Wow! Mom and I just want to thank everyone who stopped by the last post and offered up all the nice comments and encouragement. After all that work, your words really hit the spot. We just hope that you will all have as much fun making the shams as we did! Just send your shipping address to hmulder@wecnet.com and we will ship out the books! Are the pillows stuffed? No, we used pillow forms in standard sizes. What came first, the quilts or the pillows? The quilts have all been published in my previous books, so we made the shams to go with quilts we already had. Are the quilt patterns included in the book? No, they are published separately. This book only contains the patterns for the pillow shams. Do you have a supplier in the UK or Australia? We never know exactly where our books and patterns end up. Many shops order from our distributors, instead of directly from us, so we end up not knowing who all carries them. I would just google the book and see if any listings come up in your area or see if any of the online shops ship internationally. What are your paint colors in the bedrooms? I always mix my own paints to get the right shades, so that is a little hard to share. I don’t usually keep track of the formulas, but thanks for asking! Many of you also commented how lucky I am to be able to work with my Mom. I agree with you! My mom can make anything out of fabric. She made all our clothes growing up, sewed all our drapes, recovered our furniture, etc. She even did the hard stuff like making Dad’s suits, our winter coats, and snowmobile suits. One year Mom even made a covering for a black inner tube, complete with handles, and we pulled it behind our little boat! She has always had this can-do-attitude when it comes to sewing and so capable that she can carry off any plan she comes up with. I am so grateful to have grown up surrounded by this attitude. She learned it from my Great-Grandma Anka and I am trying to carry on the tradition! Mom says she remembers going to stay with Great Grandma for the weekend to sew. They would pick out a feed sack, draft a pattern, sew the outfit, and Mom would wear it to school on Monday. You can’t beat that! It’s so fulfilling to be able to make something out of nothing . . . well not nothing, but just pieces of fabric. On another note, I have enjoyed having the book, pattern and fabric deadlines behind me. I even did some goofing off! I started with some cooking. . . I got Pioneer Woman’s Cookbook for Christmas, and I’ve been wanting to try out some of the recipes. 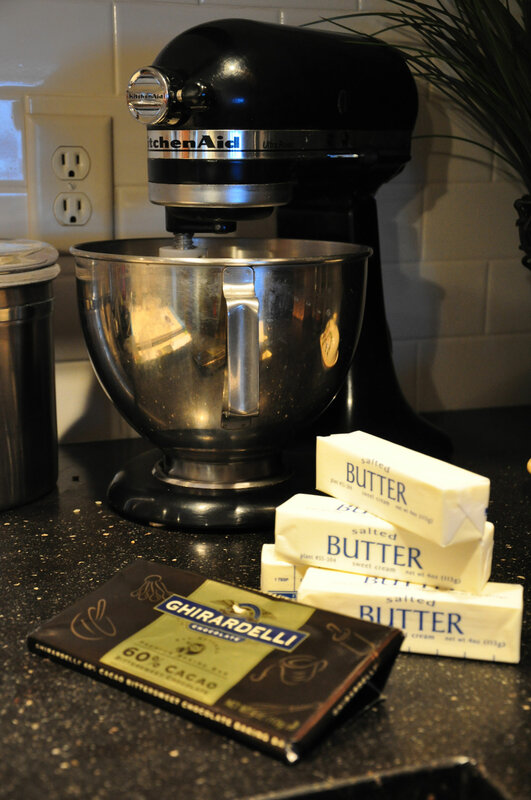 I decided to start with the mocha brownies. They contained this much butter in an 8 x 8 pan! Have you ever heard of that much butter in such a small pan? 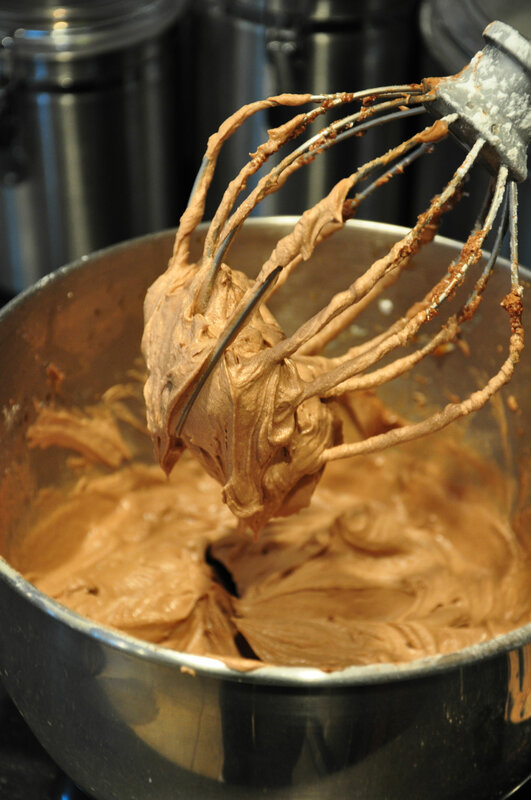 The frosting was as thick as the brownie! They looked good on the serving dish – the only problem was they were so rich that I couldn’t eat more than a bite or two. It didn’t stop me sampling them! 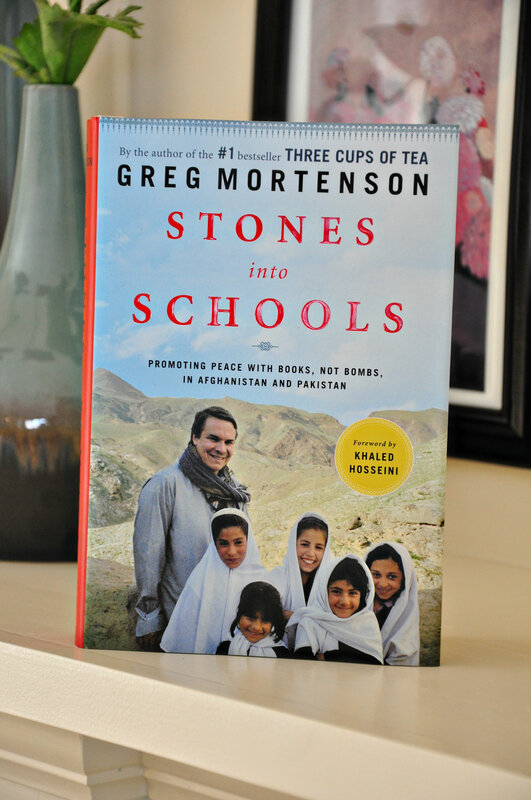 I really enjoyed Greg Mortenson’s first book, Three Cups of Tea, so I wanted to read his second book too. I thought it was so interesting and inspiring to learn about the culture and all the good things that The Central Asia Institute is doing for girls and their education in this region. I also started a new quilt. It’s using the fabric line Verna by Kate Spain. It’s so gorgeous! I’ll show you more when I finish the quilt top! I’m also dying to start working with this line – Simply Sweet by Barbara Jones. 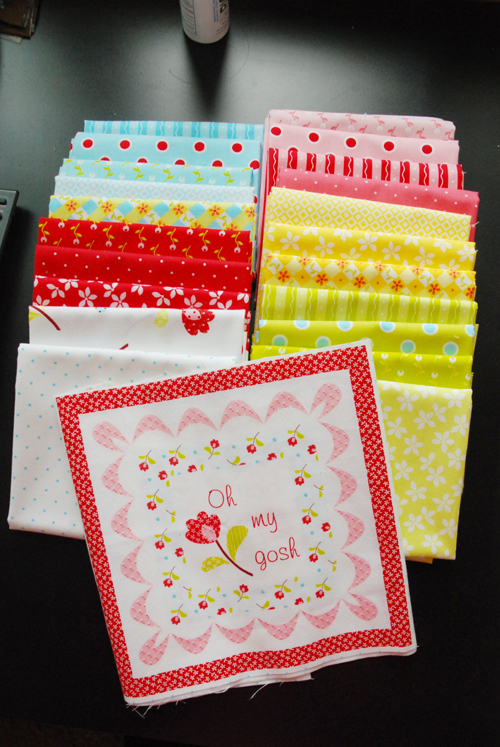 My design director Karen (from Henry Glass Fabrics) sent me these to play with! Thanks Karen! I’m going to work in a few pieces from Barbara’s previous line – Bubble Gum Basics. 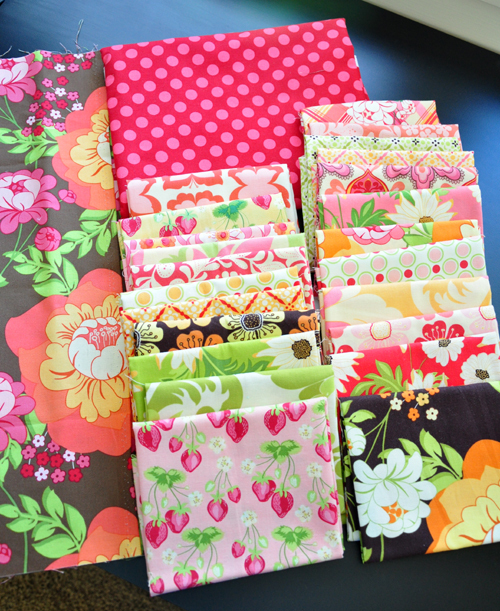 My next fabrics to cut into will be these – Meadowsweet by Portobello Pixie. So, as you can see, I will be taking it easy. There will be only fun projects, with no deadlines in the studio this week! Yeah!!! It’s a great change of pace from book editing. Once again, a HUGE thanks from Mom and I for your support of our last book! This entry was posted in Fabric Trends, Quilting and tagged shams with style, simple sweet, verna. Bookmark the permalink. Thanks a lot (not) for the brownie photo. I’m trying to diet here!!! Congratulations to the lucky winners. I keep finding myself NEEDING Meadowsweet. I also couldn’t resist that Meadowsweet fabric and am about to use one of your quilt patterns to make a fabulous quilt. Can’t wait to get started. Work gets in the way though!! What pattern are you using for the Kate Spain quilt? Brownies look yummy. Such pretty fabrics. Congrats to the winners! Congrats go out to the lucky winners, but I’ll also win just as soon as I pick up my copy! 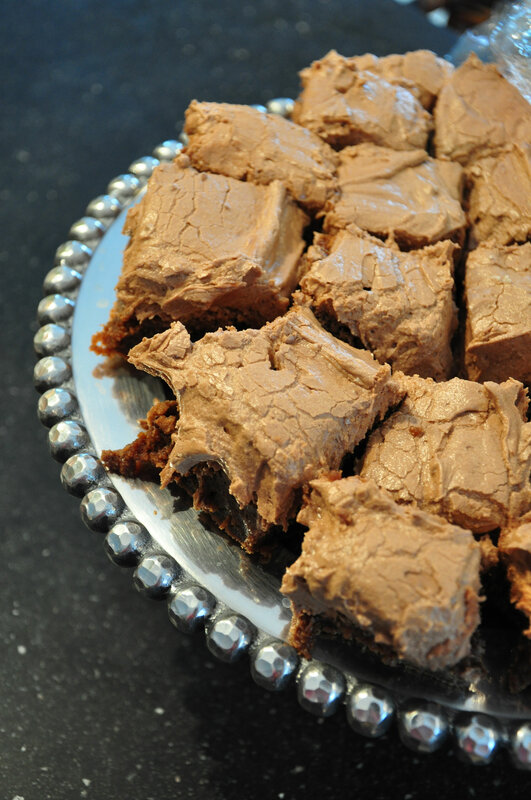 Oh My – those brownies….. trying to diet here, and one peek sent me over the edge. LOL!! Oh, thanks Heather!!!! Wow, I am so excited (jumping up and down)! I have so many pillows to make and now I have some direction. I can’t wait to see what you make with the Meadowsweet fabric. Please share when you are working on it. 🙂 Thanks again! Those brownies look lethal, but what a way to go,lol! Congratulations to all the very, very lucky winners! Ooooo, I adore chocolate, but that IS looking far too much! 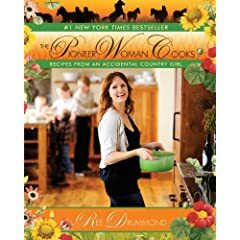 Pioneer Woman is the stuff tho, so entertaining. I really love both the top and bottom fabric collections. Very anxious to see what you create with them. Many thanks to Heather. I can’t believe I won!! Can’t wait for the book to arrive. I got PW’s cookbook for Christmas too. She is an amazing woman. Photographer, mother, homeschooler. Very funny. I have been following her blog for a few years and she is a good cook! Not sure if her recipe for Chicken Scallopine is in the cookbook – I got it from her website – but it is so TO DIE FOR! Easy too. Can’t wait to see the new quilt! Congrats to the book winners. Happy sewing to you gals. 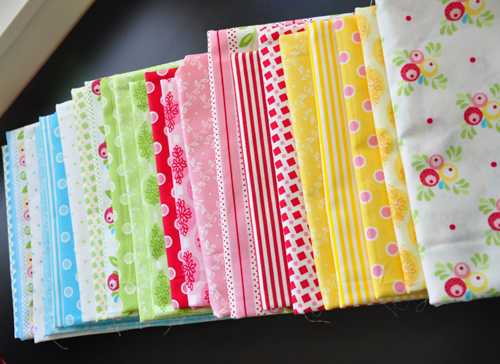 What pattern are you using to make your verna quilt out of? Is it one of your patterns or a new one? It’s called Gypsy Girl and can be found in the book Fat Quarter Five. Make the lasagna next…..best ever! 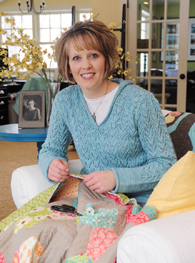 I loved the pictures of your quilts and matching shams. Beautiful. Can I ask a favour can you tell me the names of the quilts you used on the beds or what books they came from please? You could send some brownies to our place they look delicious. Oh my, I think those brownies would be way too rich for me, but you’re right, they look fab on the plate. Lucky you to be playing with such yummy fabrics. They look awesome! Congradulations to the winners. 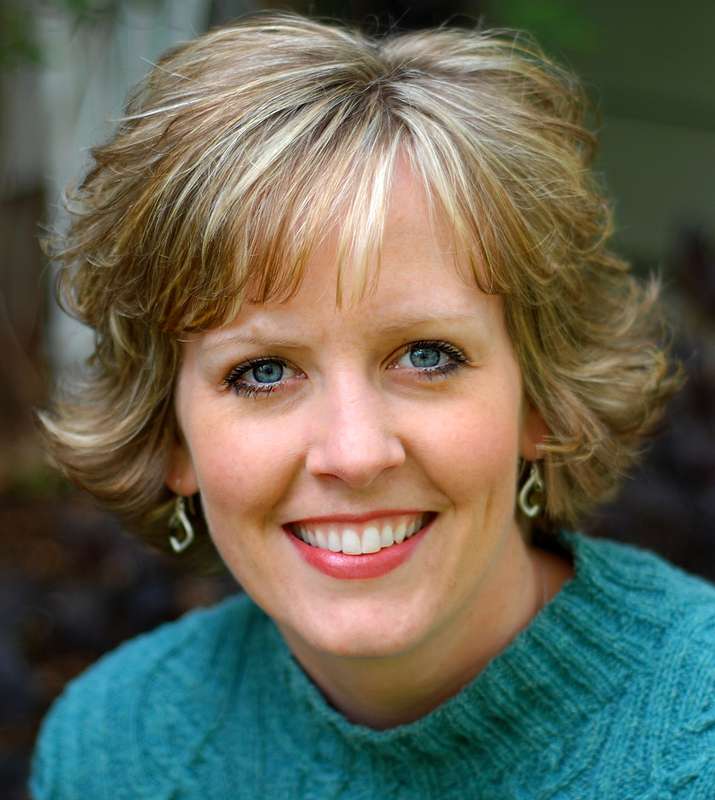 Heather, you are so lucky to be able to work with your mom. The fabrics you are working with are beautiful. I loved Three Cups of Tea and Stones into Schools..they were both such inspiring books! 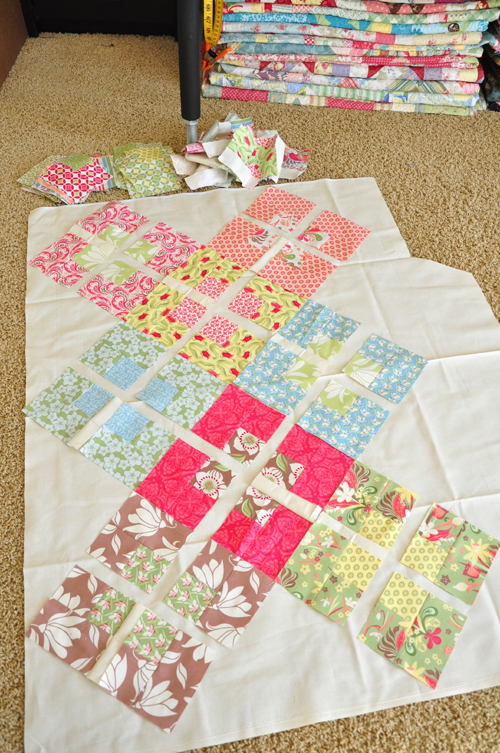 I’m making Modern Day Diamonds with my Meadowsweet…have it ready to go…and can’t wait to see your Verna quilt! Congrats to the winners! Love all the new fabrics you are playing with — lucky you! Congrats to teh winners I will be buying this one. the brownies look so good! Congratulations Winners!!!! I’m attending weight watchers meetings and those brownies are probably 28 points for a 1 inch square bite. They look yummy!!!! Have fun playing and be sure to share with us all your fun work. Will be looking for your new pillow book. I got a catalog today from Clotilde….showing “bed runners”…like table runners but on a larger scale. Made to go across the foot of your bed, on top of a solid colored comforter, etc. Thought that was a cool idea, and a way to expand the table runner patterns. Love those fabrics. I have some Verna that I want to cut into, too. wow, do you sleep? FANTASTIC blog! love your taste in colors, fabrics, patterns, everything! Will be watching you for long time, sew much fun!! !